This over-bore turns your 600cc engine into a 662cc engine. We use the same piston in this kit that is used in out 738cc over-bore (600HO and 700 Series III Engine). Besides the awesome power increase, the benefit of not having the power-fade associated with the single ring piston (OEM) is what you will really notice when running this kit. 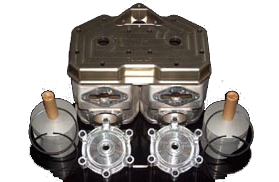 RK Tek has developed an Over-Bore kit for the 500SS/600 Series III Engine.